Yep. Spring has definitely sprung yall. Down here we usually have two seasons...summer and some cooler weather in December (not a fall or winter like most of you). Almost miraculously, these past few weeks have been gorgeous. It gets cold at night and very pleasantly warm during the days. A nice change from hot, hotter, hottest, and not so hot. Thus, we have been enjoying every single minute of it by being outside as much as possible Yesterday, as you read, we did that by going to the zoo. We could not have asked for a better day. I certainly could not have asked for better, or more beautiful kids. The whole experience begged for us to stop and smell the flowers. We were, I am happy to report, able to avoid tiptoeing through these tulips. We were not able to avoid, however, taking a million pictures of them. Because of the extreme generosity of a great friend, we were able to go to the zoo today for free. It has been a year or two since I took the all the kids there. This was Max's very first time there. When we asked him what he thought he might see there, he really didn't know. The kids told him that he'd see lions and tigers. "And clowns?" Max asked. Considering his recent trip to the circus, this was not as far-fetched as it may sound. Of course every time we went past a statue of an animal, they wanted their picture taken so I have lots of those. But when we got to the giraffes, I had to try one. They were the animals that took my breath away. Now I'm wondering if it's slightly weird that while I was admiring their beauty that I was also thinking a nice giraffe skin rug would be interesting in my living room? My kids are thrifty little things. When I wouldn't give them money to feed the animals, Aiden went to the ground under the feed machines and picked up enough food to feed them twice! That's my boy. My mom, who went with us, forked out the money for them to ride the carousel. You got to love grandmas and my kids certainly do. Let me just say, look at those baby blues. What is it about going up and down in circles that's so totally fun for kids? I, on the other hand, fought nausea while holding on to Max. I had to include this photo because it is what I wished I was doing at that very moment and, I have to admit that I was a tad bit jealous of his ability to lay around with absolutely no apologies. It's utterly amazing to me that my kid who has banged his mouth and knocked his teeth loose more times than I can count, actually lost his first tooth legitimately. It has been killing him lately so I finally pulled it and oh, what a relief it is. Today I woke up a little excited about the beginning of Spring Break. I then went to school, averaged and entered quarter grades and taught class. On my way out I stopped by the trucks being unloaded for the Senior Class Rummage Sale tomorrow and spotted two trunks that I thought might be just what I was looking for to make my living room homier. That led to multiple phone calls to various people and lots of bargaining with the class and my husband, who was not exactly sold on the idea. I went home, threw together some pizza dough to rise, changed and took Max to a gym to meet with his new therapist. This involved an hour long session and an hour in transition there and home. I got back just in time for Dawson to walk through the door from school. I put together the pizzas and made several therapy related calls about Max. Mackenzie and Aiden came in and needed snacks and a daily review of school events. While they were outside playing, I did a quick pick up of my bedroom and then popped the pizzas in. At 4:15 I called the kids in to get them ready to go to my brother’s soccer game where Aiden and Dawson got to be ball boys. At 4:20 I woke Max up to get him ready at which point my phone rang, the timer on my oven started beeping, the front doorbell rang, and someone knocked at the back door. I packed up the pizzas and the kids and headed back to the other side of town for Brian’s game. We pulled back in around 8:15 to find that Nelson was still not at home. So…I unpacked the car and the kids, grabbed them a quick snack, showered them, brushed their teeth and got them off to bed. I’m almost finished cleaning the kitchen now and I’m hoping…really hoping that I will wake up tomorrow still excited that it’s Spring Break. Aiden won his first soccer game ever today and boy, oh boy, was he excited. I think the score was 6 to 1 but depending on which boy you ask, you may get a different number. He's the one in the gold shirt. The new ones haven't come in yet which sometimes makes it hard to know which kids are on your team. That may explain why here, even though Aiden did make a few great saves, he is actually sandwiched between his own teammates. Notice that even though my folks bought him brand new soccer shoes, he is wearing his second hand tennis shoes. This is because he was wearing these tennis shoes in his first game. In that game he scored his first goal. He wore the new shoes last week and he did not score, so from now on he's thinking the tennis shoes are where it's at. This notion will only be helped by the fact that he made his second goal today. I love this picture not for its quality but because it paints a very realistic picture of our backyard soccer experience. Note the "Jordanesque" tongue action and the look of total determination on that little face. Also note that the ball is in exactly the opposite position of where it should be. You know, he's young and there is a learning curve to this athletic stuff. At this point there is as much comedic relief as competitive action. I think that's the way it should be because it sure does make it a lot of fun! if you sent your boys to the shower unattended and when you took yours later, you saw this? It gave me pause a moment as I wondered how exactly they got clean after this happened. Then I figured that they stayed in long enough that even if they didn't scrub, most of the dirt probably got rinsed off. Really, small price to pay for a moment of peace! I'll be the first to admit that I know nothing about gardening. I have had gardens before but I still don't claim any knowledge at all. However, for some strange reason, I love planting things and watching them grow. I don't really even mind the weeding. There's something therapeutic about having a reason to be outside getting my hands dirty. Saturday I planted a few black-eyed susans that a neighbor was throwing out. This afternoon I planted a few day lilies that someone on my street had put out to the curb for the trash. I have no idea what color they will be or if they'll even grow, but at no cost I figure I can't lose. There I was piddling in the flower beds when an overwhelming sense of gratitude hit me. My beds were going to be fuller this spring and hopefully more beautiful because of the generosity of others. I truly felt as if I had hit the jackpot. I had more than I could plant at one time and I didn't have to pay a dime. I think my life is a little like my flower garden. Most of the time I don't know what I'm doing other than praying that I somehow keep myself in the center of God's will...you know, not kill anything. Like my flower beds, sometimes I succeed and sometimes I don't. However, when I let other people in my life - their wisdom, their generosity - it makes me a more beautiful person. It allows a little cross pollination and encourages growth. And the best part is it doesn't cost a thing! Dawson decided to give up drinking everything but water and milk for Lent this year. It has proved much tougher than he ever imagined. Last night, I was drinking a beer with my pizza when Dawson approached me. "Can I please have a drink of that?" I paused a moment while considering letting him take a sip when he added, "Oh, wait, I forgot. I gave that up for Lent." I've been trying to get this on film for months but for some reason, he gets shy when I turn on the camera (a first for the Parris family). Today I bribed him with a chocolate pop tart and this is the best I got. At the end, he gets in a hurry to end it so he can eat the pop tart, but it's still pretty cute. is SO MUCH FUN! In fact, I think it's four times the fun with four kids in tow. I found this photo on our local paper's website today. Besides not getting Mackenzie in it, they did a better job of getting smiles than I did. 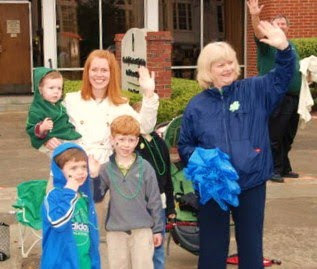 When I moved to Augusta, in the ninth grade, I thought this town's St. Patrick's Day parade was the saddest excuse for a parade that I had ever seen. Think people dressed in green walking down the street throwing candy with one hand and drinking a beer with the other one. It hasn't changed much from that first time, but I've acquired a taste for it. My kids LOVE it...I mean, candy literally flying. Who wouldn't? Today's parade offered more than just candy. The circus is in town and the kids all got clown noses too. Of course, we ended the day with traditional fare. I've eaten this meal for most of my life on this day and it wasn't until today that I realized it is the color of the Ireland flag. Sometimes I'm a lot slow. Little Max had a blast even though it was cold and rainy. When we got back home, he managed to put all of the parade beads around his neck. If you've followed this blog for awhile, you'll recognize this cake, which has become our own little St. Patrick's tradition. It's Nelson, Mackenzie and my brother Brian's favorite cake and it works today because the inside is kind of iridescent green. I am, however, open to a new idea. Anyone else have a fun St. Patty's Day dessert they want to share? I posted about the Julius Caesar experience but never put up any pictures. She was wonderful of course! Here's the little guy the day after he busted his lip and knocked the tooth loose. You should have seen it the day it happened. Seems the tooth fairy may visit him earlier than expected. This is little Mackenzie in her very first basketball game in which she scored the first basket of the game and was the second highest scorer with 4 big points. Mackenzie we are proud of you! It's been two years of bliss with Maximilian. It's also been two years of visits to doctors' offices, hospitals, a surgery, and lots of therapy. This is what I was pondering as I waited today for another doctor to see this beautiful boy of mine. We had been waiting for over 45 minutes when I realized how much of my time with Max has been doing much of the same. This was not what I had in mind when I was pregnant. It's like I got on a plane headed to Italy landed in Africa. There's nothing wrong with Africa. But when you pack and plan for Italy and you end up in Africa, you are hardly prepared. I sat on the plane in denial for awhile. I did not want to be in Africa. I wanted to be in Italy meeting the pope and eating pasta. The stewardess assured me that although what was outside was not what I had expected, it was certainly better than spending the rest of my days on the plane. And with a gentle shoved, I finally disembarked. Of course, my first impression was that Africa is not anything at all like Italy. Everything is different - the language, the weather, the food, the terrain, the people, the sites - EVERYTHING. I was disappointed and scared. How was I going to survive? Upon further inspection, I learned that Africa too, is beautiful. It has some hot weather and political unrest, but it also has beautiful grasslands, friendly people and amazing safaris. It's hard to focus on the heat and bugs when you're staring a lion in the face. I've discovered that life here on this continent is not so bad after all. My guides have been amazing and taught me so much about this culture. They've even made me an honorary citizen. I'm finding that after some time and adjustments, I've learned to love this country. This is where I was, in my open air jeep in the middle of the grasslands watching a lion club at play, when he morphed into Max sitting patiently on the floor of the exam room spinning his car in circles. Finally the doctor walked in. After some inspection, he let me know that both of Max’s tubes had fallen out. He did a little maneuvering and out they came. “His ears look great. Looks like today saved you another 6 month check up. You’re free to go,” he calmly said. I walked out in disbelief that I can really check one doctor off the list. Neurologist, pediatrician, physical therapist, dentist – all still on the calendar. ENT – one giant check. For the first time in two years I began to think I might actually make it on that plane to Italy after all. But until I do, I’m going to make the most out of my time left in this beautiful country I’m in. Another CRAZY BUSY day. I can't write much except that I need a little less craziness. In the middle of this one I discovered that Dawson had fallen on concrete steps and not only busted his lip, but knocked his front tooth totally loose and the one next to it may have to go too. Details and pictures will follow. Please pray against accidents and calamity! Tonight we were watching a show we had recorded on the DVR. While I was fast forwarding through the commercials Aiden asked, "What do the people on this show do while there is a commercial?" "Well they go to the bathroom, get a drink of water, talk to each other and get ready to go on stage." "And when you fast forward, do they just have to do it really, really fast?" Yesterday started at school. I usually teach my class, come home, change out of my uniform and get on with the rest of my day. Yesterday, however, I was still in my uniform at midnight, shortly before I fell into bed. It was a day of several large, time consuming projects, in the middle of which one kid, who was feigning sickness, had to be picked up from school. At home the same kid was miraculously healed of said sickness and wanted to play the rest of the day away. After some serious discussions about telling the truth, the kid actually managed to “throw up”. Amazing, truly. I was frustrated and tired but I prefer to focus on the chance at a wonderful acting career later in life, with the chance this same kid might be able to support me in my old age. Before dinner one of the boys managed to crush Mackenzie's hand in a door. There was lots of screaming. Once that had settled, the already swollen and bruised hand had to be iced and a boy had to be dealt with. Tucking in Mackenzie I discovered she needed the PE uniform that was in the wash so I had to throw in a load of laundry while I tagged and prepared about 50 items for a consignment sale. I woke this morning a little tired but ready for a new day...a better one. However, upon inspection of Mackenzie's hand by my mom the nurse, it was determined that an x-ray may be in line. It was like a repeat of the day before only slightly different circumstances. I taught class and rushed home for Max's therapy. We got the therapist out the door and hopped in the car to drop off the stuff for the consignment sale after which we had 30 minutes to dart back to school, pick up Mackenzie and get to the doctor's. After and hour and a half at the doctor's, we were sent to the ER for x-rays. Once I signed in and looked at my watch I realized it was already one o'clock and no one had eaten. I called my mom who came to the rescue and took the two little boys to McDonalds. X-rays taken and no results from the ER doctor, we were finally released so I could get us something to eat. It was 2:30. We got home in time to make it to the soccer field for Aiden's practice, where I received the news from the doctor that they can't see a break but there could be one. We're to ice it, exercise it and if it's still sore on Friday, we may have to do the whole thing over again. By the time I walked back in the door, it was 5. Barring the hour I was home for Max's therapy, I had been gone since 8:15. I am exhausted. I'd like to believe this will be an unusual occurrence, that tomorrow things will be back to normal and all will be okay. However, I know this is probably just one small exercise in real parenting. When I signed on to be a parent, this kind of day was in the fine print. And, my guess is that there will be days like this, worse than this, to come. There will also be days much better than this - great days – days that make you grateful to be a part of the life-giving process. Those are the days that make days like that last two tolerable. And the best part is that tomorrow will be another day. We have a fenceless yard and in it is a trampoline. As you can imagine, we have loads of kids on the trampoline on any given day. This afternoon some older boys were jumping on the trampoline as I was walking through the yard. "Hey, let's play that country game," said the one. "Yeah, okay," replied the next one. To which the third one responded, "Well European." No one responded so he repeated, "European...you know, European...you're a peeing and European!" Then all three fell on the trampoline laughing hysterically. This has been a year of remembering for me. Being in the classroom again has reminded me how much I love teaching. Helping out with Mackenzie’s play has reminded me how much I love directing. Today was the dress rehearsal for Julius Caesar and unfortunately, the student who plays Marc Antony was sick. The director instructed me to take back stage duty as well as stand in for Marc Antony in the final scene. Although I thought I would look hilarious, I agreed. When the final scene began and I walked onto the stage with the bright lights shining in my face, I suddenly remembered that before I fell in love with directing, I was in love with acting. I towered over those little 4th graders when I climbed onto the chairs to make the famous “Friends, Roman, countrymen” speech. Unable to hold back, I gave it my best shot. And, just like that, it was over. I don’t have the time it takes to be in a play these days. But today…for my 4 minutes of fame…I had fun. Today between teaching class, helping out with the 4th grade play, and checking in on Aiden, it occurred to me that parenting is really hard work. Of course, this is not a new understanding, it was just driven home in a different way. I've decided that parenting young babies is hard physically. As they get older it's not as hard physically, but tougher emotionally. And mine aren't even that old yet. I'm waiting for the stage of parenting that gets easier. I get the feeling that may never happen. I'll just wait for grandparenting. That should be fun...and easy...right? Friday morning I began the day on camera. The video class at school had been requested to put together a video on miraculous healings and they asked if they could interview me. It almost took me by surprise. It's been so long that it happened that I almost forgot - not that it happened, but to talk about it at all. The young ladies who arranged the interview not only forgot to bring their questions, but they also forgot what they were. "Why don't you just talk," they told me. And so I began. “When I was in middle school my mom was having me try on a bathing suit. She kept telling me to stand up straight and I told her I was. After a trip to the doctor, we discovered that one of my legs was an inch longer than the other. That meant my spine was growing curved rather than straight and I was diagnosed with scoliosis. It wasn't long after that that my mom took me to a healing service at our church. I'm guessing it was for the anointing of the sick but it was a long time ago. What I remember is standing in front of the Blessed Sacrament. The priest laid his hands on me while standing in front of me and my mom stood behind me and did the same. There were no lightening bolts, no loud voices...not even a tingling sensation. I left there and didn't think much more about it. It's not that I didn't believe that God could do miracles; I just didn't see any reason why He would do one for me. Soon after that we returned to the doctor to check on my growth. To all of our surprise, my legs measured the same length that time. "It's a miracle," I remember my mom exclaiming right there in front of everyone. The doctor agreed that there was no logical explanation for why this happened. He did however warn us that we were not out of the woods just yet. Although my legs had evened out, my spine was still crooked and the more I grew, the worse it would become. He said that if I grew a few more inches, we would probably be looking at surgery to place a metal rod in my back. While I accepted the fact that God had indeed performed a miracle for me, I didn't talk about it too much after the fact. What I did do was continue to grow and as I grew, so did the discomfort. By the time I was in the ninth grade it was hard for me to ride in the car on long trips without excruciating pain. The summer after my freshman year in high school, I went to a conference in Notre Dame with my youth group. During one of the last sessions, the leader had a sense that there were people there who needed healing and he asked that anyone who needed healing would come down to the front to be prayed over. Now this was my first experience at a Catholic Charismatic conference and I was a little intimidated to say the least. The people who were getting prayed over were falling on the floor and others were screaming and I thought to myself, that there is no way in God's green earth that I was going to go submit myself to that. Surgery, I thought, was not that bad of an alternative. Even when a friend grabbed me by the arm telling me that she was sure I was supposed to go down and get prayers, I refused. After that meeting our youth group gathered outside for a prayer session of our own. Again, there was a sense that people needed prayers for healing. This time, my friend did not take no for an answer and literally shoved me into the middle of the prayer circle. Suddenly I found myself in the middle of our group of around 40 and everyone was placing their hands on me praying for healing. I stood there with my head bowed and accepted their prayers. Again I had this feeling that of all the people in the world, why would God choose to heal me. My condition was not life-threatening. I had certainly done nothing worthy of receiving a miracle. I was sure that God was there that night, I just had no idea He was there for me. When they finished their prayers I stepped out of the circle. Again, I had no expectations. I hadn't fallen to the ground or heard a thunderous voice. Nothing, I thought, had happened. But for some odd reason, when I finally got to the outer ring of the circle, I reached around a felt my spine. Where before I could literally trace the letter S down my back, there was what felt like a straight line. I couldn't believe it. I reached and felt my spine again. Yep, still straight. My head was spinning. I asked a friend to feel it to see if I was out of my mind but she agreed with me - straight. Finally we brought over one of our youth ministers. She was an occupational therapist and she confirmed what we had all discovered - my spine...was...STRAIGHT! By this point I had said all I wanted to say. This was a good thing because I could no longer hold back my tears. I left the crew pretty quickly because although I was trying desperately to pull it together before I had to stand in front of my students, I could feel that it was going to take a moment. I darted into the teachers' lounge while everyone was still in assembly. The sun was shining through the window and I just stood in it for a moment and took a deep breath. On the exhale I could no longer hold anything in. I couldn't believe that after all these years I would still be so emotional about this event in my life. And then again, how could I not? I stood in that sunshine for a moment and just let the tears flow. I was overwhelmed by God's infinite goodness in my life. I was humbled by the fact that I experienced His healing touch first hand. I was embarrassed that it had been so long since I had told anyone this story. I suddenly felt sure that God was there with me...again....always. I felt strong in my faith that God can pull me through whatever hardships I may face. I was sure that His will is always perfect and that He can indeed move mountains. I felt exhausted and yet refreshed. I felt grateful to have the kind of life that enables me to be surrounded by people who will pray for me with great faith. I felt blessed to have the opportunity to do the same for others. I felt empowered that with God, I can indeed do anything. I felt compelled to remember this moment in my life with the same intense emotions that I was feeling right there and then. God has miraculously healed me and I want to tell the world.